It is a tiny application (small memory footprint) than helps you keeping your system clean of unwanted / temporary files. I'm just looking for feedback, nothing more. I have just tried it and it seems to do its job well. I would not use it though as there is no backup option, in case it deletes something it should not. A lot of people use CCleaner which does the same job and also includes a registry cleaner. Plus there was no uninstaller in the programs list. Well if you could post it's memory footprint vs CCleaner's it would help. And as trackrat has pointed out and since your proggy is still in Beta, it would be a plus to have a backup/undelete option for those unforeseen booboos. Oh, and an uninstall feature, so we don't have to go digging through the entire Registry to remove all remnants of the program. EP gave him permission to do so waaaaay back. The reason for me to make this program is essentially the automatic mode which autocleans the system every X hours so that I don't have to care about. I may even remember seeing Kyle's stuff here from the xp-erience days. Thanks Kyle for the heads up on your new cleaner!! he just wants to automate the process johnny, that's a good idea...does cc have an automatic feature? 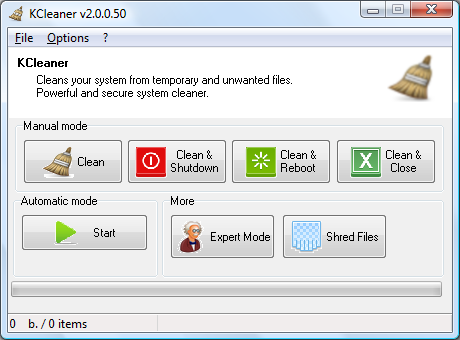 Yes, CCleaner does have automatic cleaning. CCleaner has a setting to run when Windows starts and with the auto switch it runs silently. Yes but CCleaner can't do this periodically like KCleaner do.